Get a pro range fit for your needs. Our Pro horse jump range has been designed and developed with the strength weight and appearance you would expect from any professional course. Our entire horse jumps pro range is made from maintenance free polymer and will last many years to come. 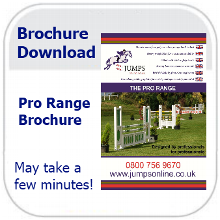 The JumpsOnLine Pro Range has been designed and developed in consultation with a top British Show Jumping Course Designer and a number of U.K. and European top level venues. From the outset, the key objective was to create a range that used the obvious advantages of maintenance free polymer materials but with the strength, foot weight and appearance expected of a professional grand prix standard course. * Strong galvanised feet to give stability in our windy island conditions. * Strong but light weight polypropylene box section frames and infill boarding. * F.E.I. metal keyhole track on all wings as standard. 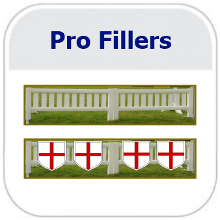 * An ever expanding range of wing and filler designs including bespoke designs where possible. * An option to purchase a combination of weighted polypropylene poles and/or traditional high quality wooden poles for compliance with appropriate standards. JumpsOnLine is now leading the way in creating a pro range that is fit for purpose. 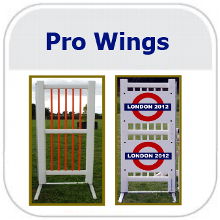 Please click on the images below for an overview of the current pro horse jumps range. Please contact us for more information and for a quotation.